1.2 Where are the apartments? 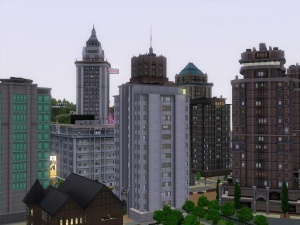 Overview This guide will briefly cover apartments in the newest expansion pack for the Sims 3. It will also help to explain things such as: Where are apartments located? Can your sim live in the apartments? Will your sim have neighbors? Can you build an apartment complex? Even more beyond that, too! ...which is enough for your sim to live off of. If the apartment isn't up to your standards, though, you can redecorate your complex any way you would like. This means adding new furniture, changing floor tiles, even adding walls, just as long as you stay in your complex. If you try to expand your room, add things such as plants or walls outside or anywhere else in the building, you will be restricted and a message saying "Homeowners' association rules do not allow this" will pop up. In conclusion, apartments function very similar to any other house. You need to pay to live there, the support life, and it keeps your sim happy and healthy. With added perks such as being only moments away from all of the action and living in a tall building with an awesome view, who wouldn't want to try out apartment living? Bridgeport is a bustling city, full of 'late night' activities like bar hopping, lounging, bar brawls, hanging out with celebrities and even the chance of meeting a vampire. To accommodate for the action-packed lifestyle presented in Late Night, Electronic Arts has provided Sims 3 players with a new feature for Sims 3 game-play; Apartments. Apartments provide your sims with a modest living quarters and a convenient housing location near all the excitement in downtown Bridgeport. Apartments are represented in the game, for the most part, as towering buildings spread across the downtown and uptown areas of Bridgeport. Each apartment is unique in that the 'rooms' you can move into are decorated differently and are not copied from one apartment to the next. Even though the buildings themselves are only found pre-made in Bridgeport, they can be placed at any time in the other towns as well. To do so, look in the lots and housing bin in the "Edit Town" mode of the options menu. Unfortunately, apartments are not clearly marked like houses and community lots are, and therefor personal judgment is required to find them. They can easily be given away by their large exterior, but fan made apartments won't have this large object exterior. They use the same system as regular residential lots. An outlines house if it is vacant, and a solid white house if a sim is occupying it, and may (in the long run) cause some confusion. Just remember though, in Bridgeport, the apartments are (for the most part) the giant buildings. Don't get confused though! There are also a few community lots with the large building objects on them. Pay attention to the headline bubbles over the buildings and explore the town before trying to move a sim in. In short, when looking in Bridgeport, the apartments are in the center of the map, with the houses scattered off to the side; In any other town, the apartments can go any where that the lot can be placed! In addition to that, you can always demolish or move preexisting apartments and edit the town as you wish. Moreover, you could always build your own! Living in an apartment is much like living in a house, but with some differences. The following section will detail a few of these minor changes as well as help give you a better understanding at how apartment life actually works! Moving into an apartment is done in exactly the same way as moving into a house: either by using the phone for a pre-existing family, or via 'move in household' in 'edit town' mode. Unlike in The Sims 2: Apartment Life sims do not rent apartments: they buy them. Now if you're wondering what the appeal is in that, apartments are much cheaper to buy than a house. They can be purchased furnished or unfurnished and, like a house, if you opt for unfurnished you will still be given basic appliances (kitchen and bathroom). You may only have one household living in any one apartment building at any one time. Apartments cannot hold more than one household. You do, however, have neighbours. 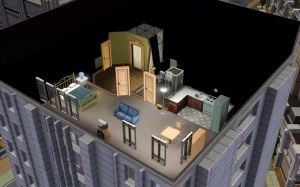 In an apartment building, in addition to the sim's own space, there are other doors leading off to the neighbour's apartments. These cannot be entered - in reality, the space is just a big, black void - but you can ring their doorbell for them to come out and interact with. When you've moved into an apartment the first thing you will notice is the lobby. This will contain a mailbox, an intercom and (usually) an elevator. The intercom is used to call on sims who live in the building, and if your sim has neighbours then you can call on them this way in addition to ringing their doorbell. If your sim invites visitors over you will be informed of their arrival by a notification asking you to buzz them in. If you click 'buzz in' then they will come up to your floor and let themselves in. If your sim is the one visiting, if the household is living in a playable apartment (one that can actually be lived in, not a void) then you will be able to go on up and visit. Buy a trash chute. It is much easier to purchase one of these than having to keep trudging out to the street. Most buildings will have these in the hallway. Remember to check your mail! It is very easy to forget about bills what with the mailbox being all the way on the ground floor. This page was last modified on 19 September 2012, at 13:30. This page has been accessed 124,482 times.